The Rev. Henry Lucas (c.1610-63) was the MP for Cambridge University from 1640 to 1648, that is, just before and during the Civil War. The most dramatic event in his life came in December 1648, when he was one of about a hundred MPs deemed to be insufficiently revolutionary and was forcibly excluded from Parliament by Colonel Thomas Pride, backed up by his Regiment of Foot and Nathaniel Rich's Regiment of Horse (though whether Lucas was arrested is unclear). The remaining couple of hundred MPs, constituting what has become known as the Rump Parliament, were able to establish a Republic, and try the king for treason; Charles was subsequently executed in January 1649. 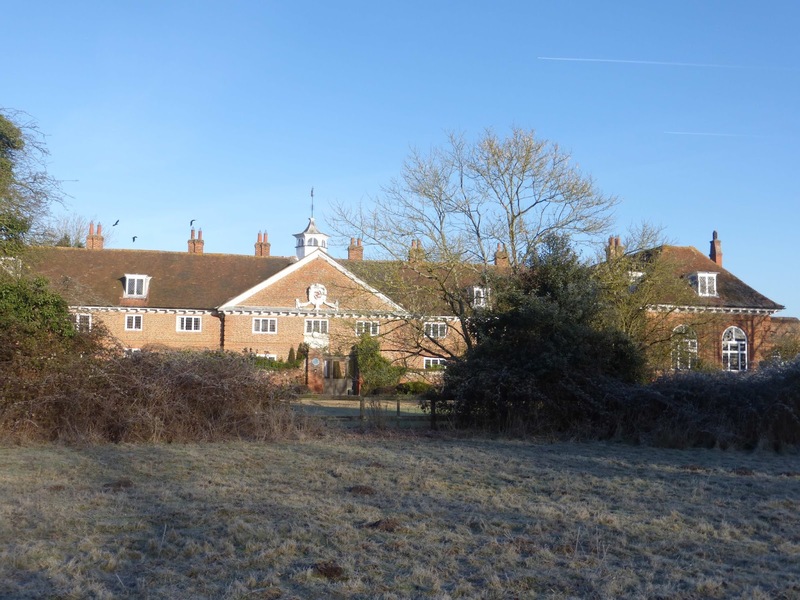 Very much less sensationally, Lucas provided in his will for the building of an almshouse for old men of Windsor Forest. 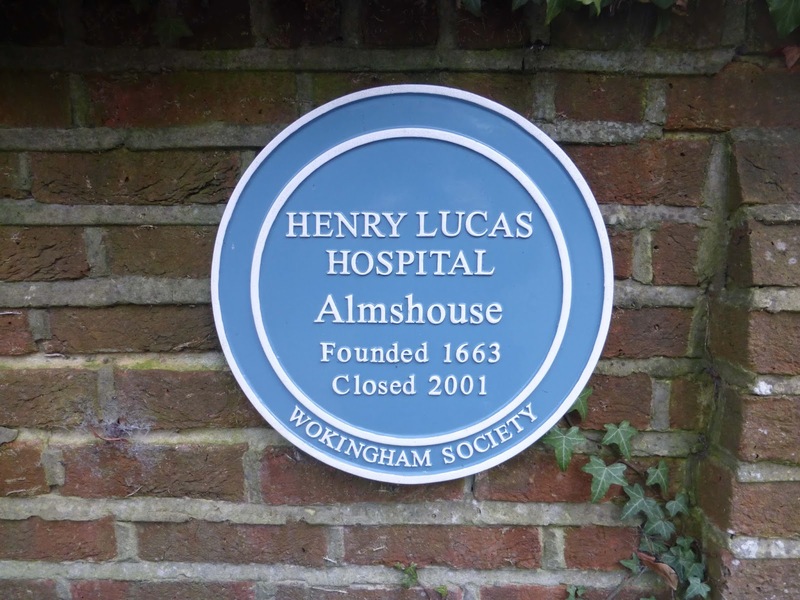 His executors bought one and a half acres just outside Wokingham, Berks (where I grew up), and built what has since been known as the Lucas Hospital (though it's never been a hospital in the modern sense). 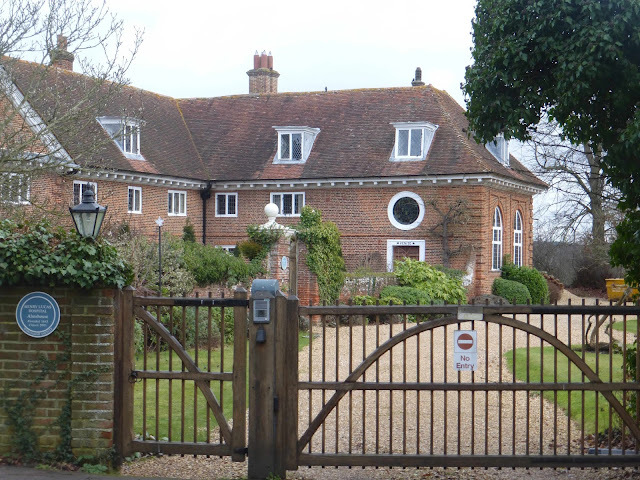 Sixteen pensioners, and a master and/or chaplain, lived there under the auspices of the Drapers' Company. 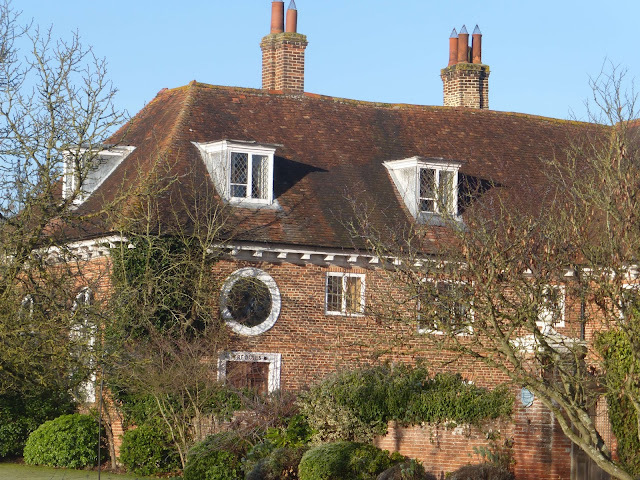 Pevsner calls it 'the best building in Wokingham without any doubt' (though the competition isn't fierce). Now it's ignominiously behind Tesco's, but it's still surrounded by fields, albeit fields threatened by possible housing. It makes a memorable sight with its rusty red brickwork and impeccably white wood, especially against bright blue skies and brittle early morning frosty grass as on one of my recent visits. 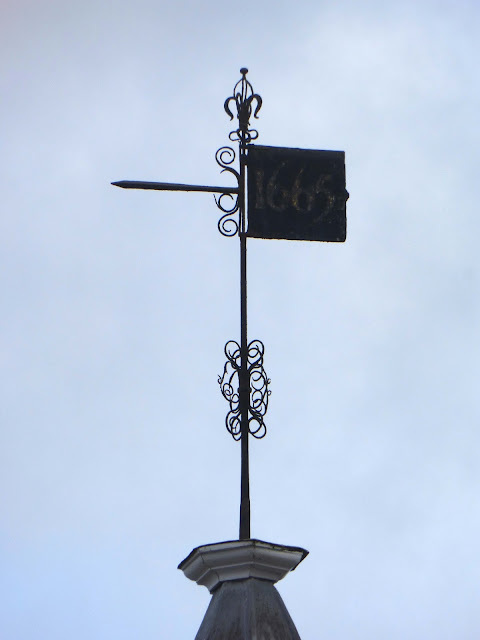 The building was complete by 1667 (the date on the weather vane is 1665), and has remained unchanged (at least externally) since. 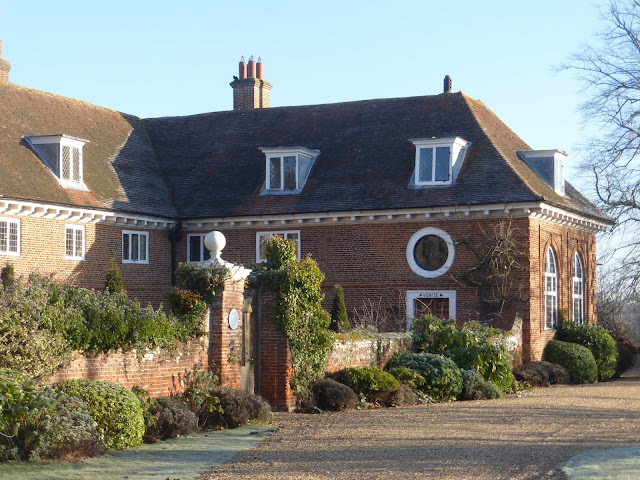 It achieves its effects by being essentially fairly plain - most of the latticed windows, for example, are very simple and unadorned - but perfectly proportioned, and rationing the use of swanky detail. 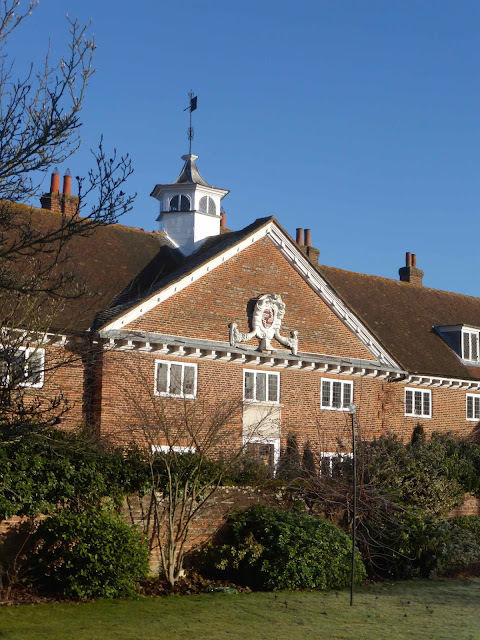 The ratio of the height of the brick walls to that of the roof is about 3:2, which pleases the eye. The eight dormer windows break up what might otherwise be a visually overwhelming expanse of tiles. The slightly projecting central pediment provides a focal point. 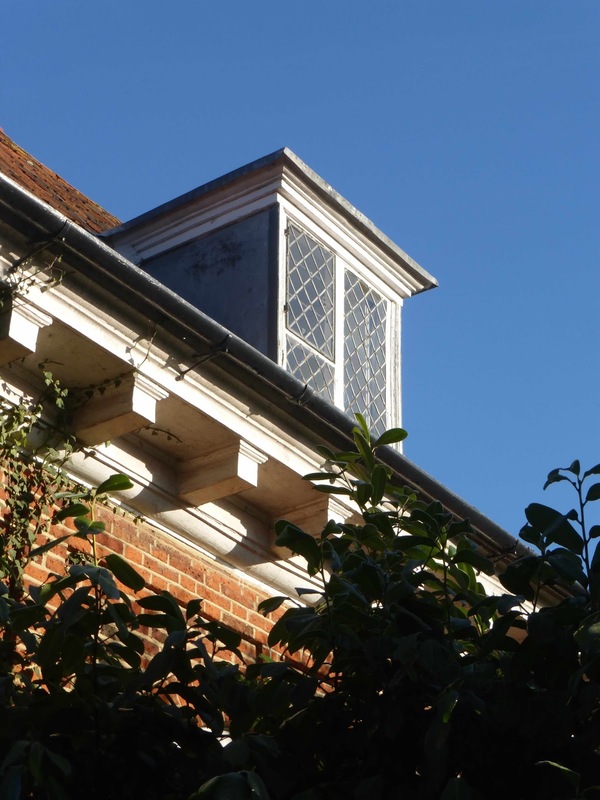 The windows are of three lights here, but then, working out from the centre, alternate between three and two lights until, at the inward facing ends of the wings, large and, surprisingly, round windows provide variety. 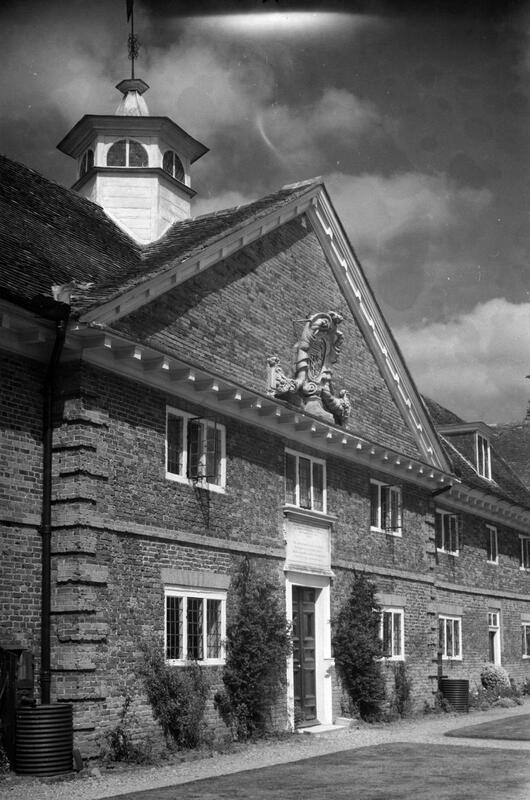 The facades of the wings each have two big arched windows, set in moulded brick surrounds; the windows are divided into eight compartments of differing sizes and shapes. 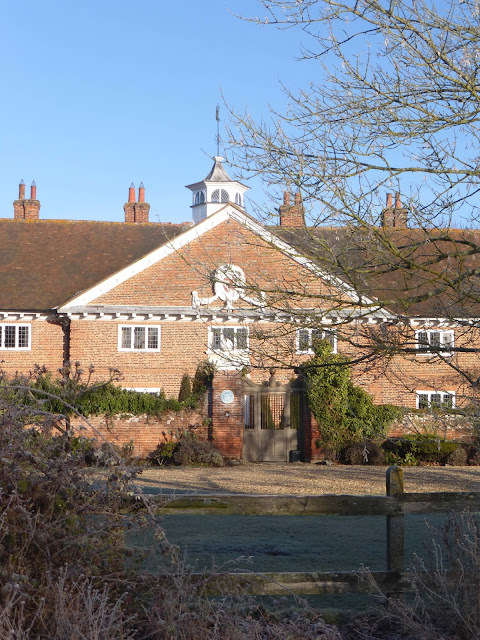 An elaborating feature of the front is the overhanging roof supported by prominent modillions, which add interest (and are of course structurally necessary), especially when they cast diagonal shadows, further enriching the geometry of the building. The pediment is topped by a white hexagonal bell-turret, with concave lead roof; it looks as if the round windows would nestle perfectly in the hollows. The semicircular windows divided by a central mullion echo the tops of the arched windows in the wings. 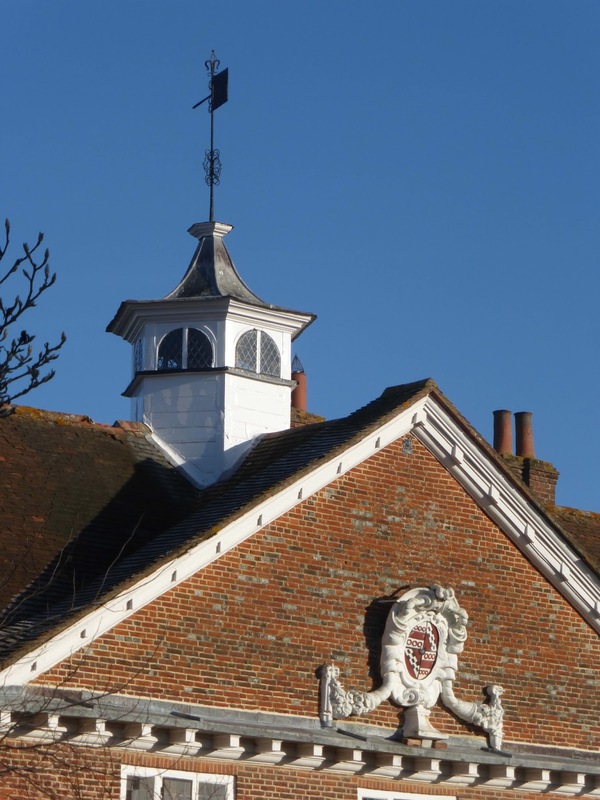 The turret is topped by a weather vane on a wrought iron pole, which has fanciful curlicues. 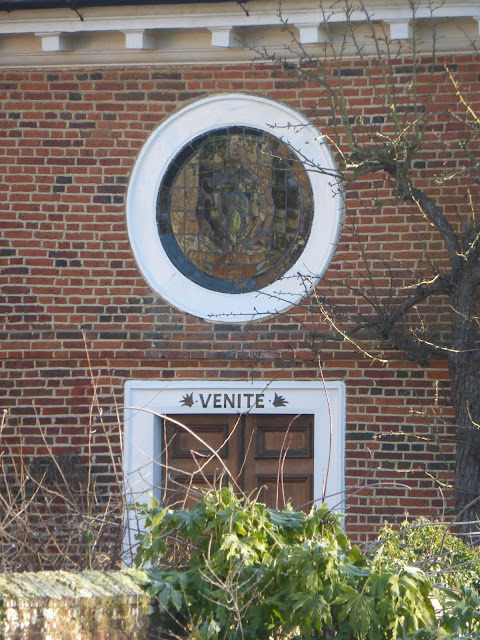 The right wing contains the chapel; over the door is painted the word 'venite' ('come'). The left wing has the hall where the pensioners ate and socialised (some sources, however, say that this was where the master lived), and has the word 'requies' ('rest'). The back and sides of the hospital are much harder to see, partly because of the trees. The photo above was taken recently, that is in January, so the foliage will be even more obscurantist at other more verdant times of the year. 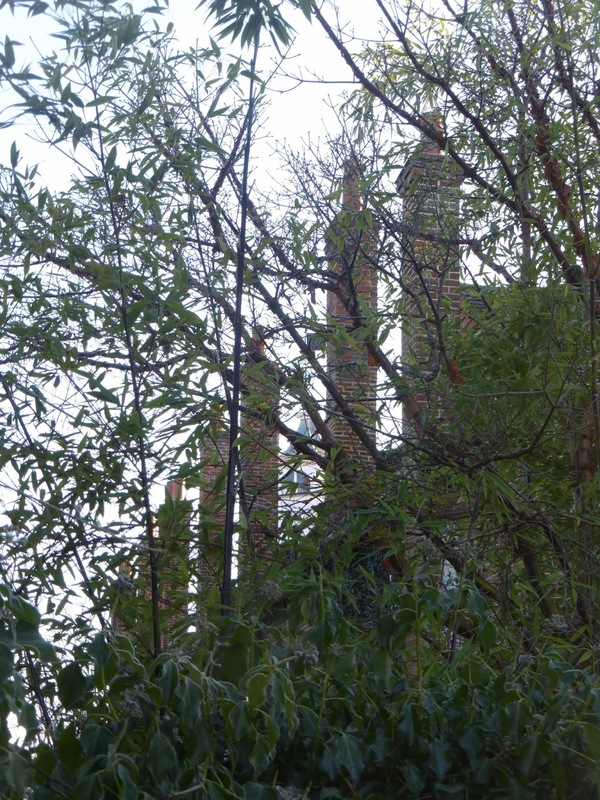 However, it's clear that the main features are the preternaturally tall and slim chimneys, six sprouting from the back and two* on each side. Is there a practical reason for their being so tall, or did the builder keep going higher just for the visual excitement? They're so slender that you'd think that they'd be in danger of being felled by strong winds; they're still standing proud, however, and they're thrilling, a gesture of architectural bravura every bit as assertive as the cartouche, though fashioned from the most humble ingredients. I've been trying to think of a collective noun for the stacks; they could be compared to trees, so an avenue of stacks, or ships' masts, (they’re like two first-raters docked stern to prow), so perhaps a flotilla of stacks. Or they’re like columns. A colonnade of stacks? A peristyle? 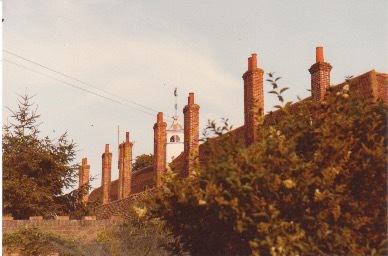 The photo above was taken in the late 80s; this view is no longer possible. I like the way the turret can be glimpsed between the stacks. 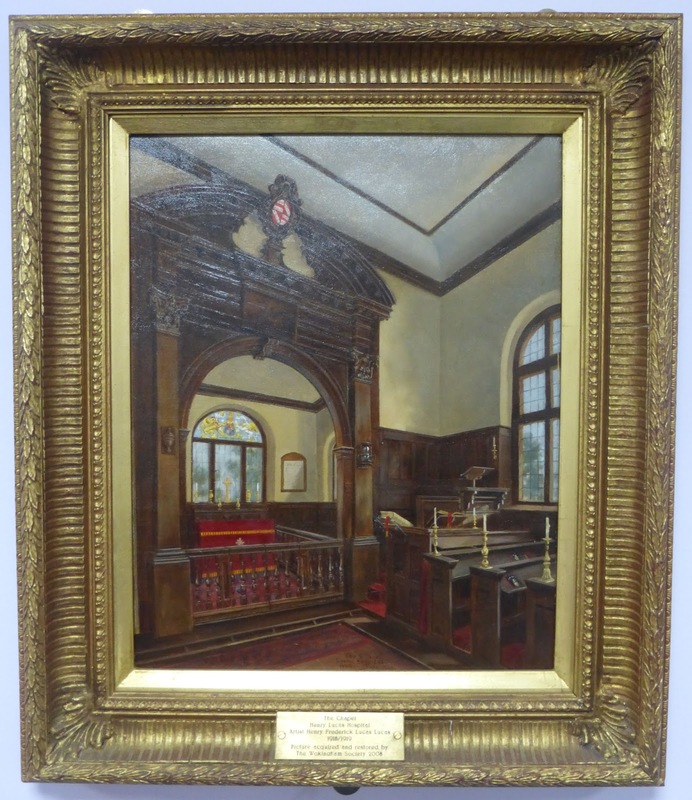 This painting, which shows a similar view of the chapel, is by Henry Frederick Lucas Lucas** (1848-1943), best known for depicting sporting subjects; he wasn't related to the Rev. Henry Lucas, but he was the brother-in-law of the Rev Joseph Stratton, Master of the Hospital 1889-1917. The picture was bought by the Wokingham Society in 2005, and now hangs in the town library. 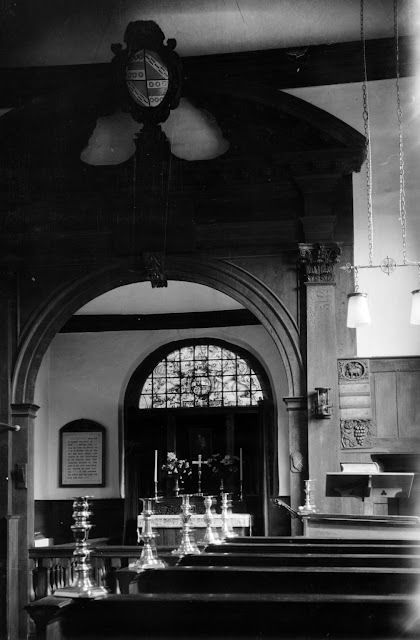 It shows more clearly than Piper's photograph that the chancel forms a short extension, visible in one of the photos above. Also the detail of the reredos-like chancel arch and altar rails are more clearly delineated. Another John Piper photo. Googling will supply a few more. 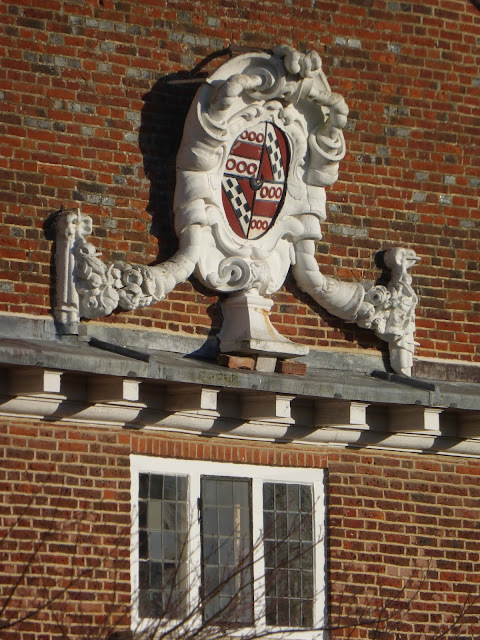 It is sometimes claimed that the hospital was designed by Wren. The only evidence for this is that there was some contact between Henry Lucas and the Wren family back in the 1640s, so it’s possible that Lucas met Christopher (born 1632) when the latter was a teenager. However, there's nothing to suggest that Wren had anything to do with the hospital. It would be exciting to be able to add a new, very early, building (his first, Pembroke College chapel, Cambridge, dates from 1663) to his oeuvre, but sadly we have to dismiss this claim as a romantic daydream. On the world stage, Henry Lucas's most famous legacy is the Lucasian Chair of Mathematics at Cambridge University, which he established, along with the hospital, by the terms of his will. This important professorship has been a key scientific appointment for more than three and a half centuries, though only nineteen people (all men so far) have held the post, including Isaac Newton, Charles Babbage and Stephen Hawking. 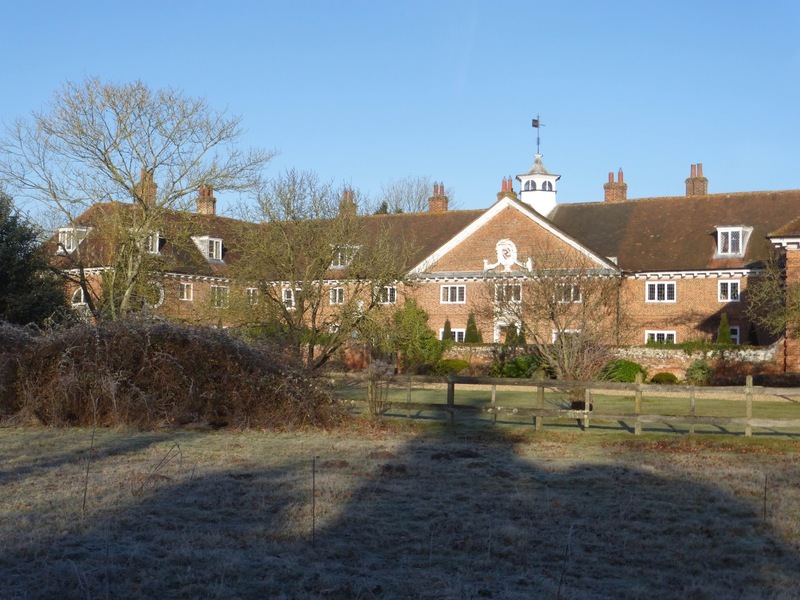 By 2001 (and probably well before then) the hospital was no longer suitable for the housing of old men (and women, as married couples had been admitted since 1923), and the Drapers’ Company decided to sell it and move their pensioners to newly built accommodation in Walton-on-Thames, Surrey. 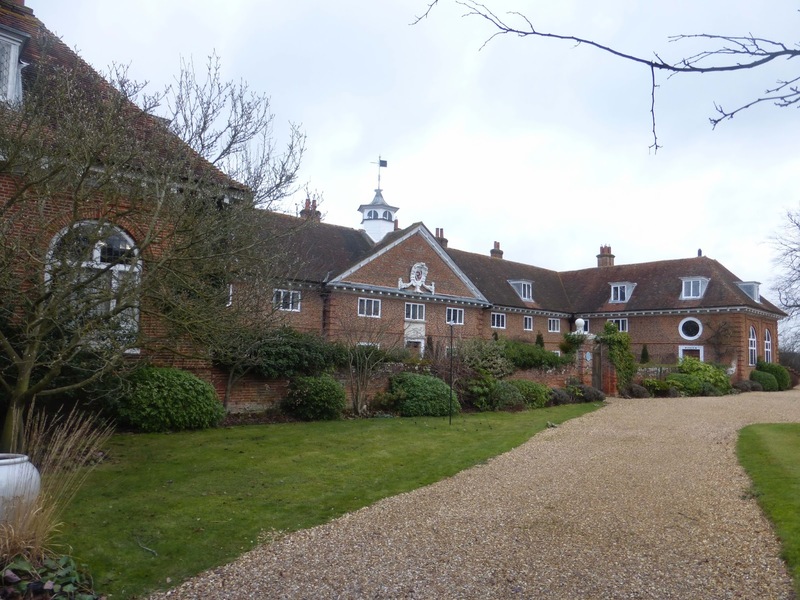 The hospital went on the market at a guide price of £1.1 million (a price that 16 years later will buy you just two perfectly ordinary four bedroomed houses in Wokingham), and was sold as a private house. It’s a grade one listed building, so the owners would be unable to make anything other than minor alterations, and you have to wonder how practical it is as a family home. Nevertheless, I'm deeply envious of its lucky inhabitants. * The Statutory Listing says one on each side. Once again, it fills me with childish glee to be able to catch out the professionals. ** This isn’t a typo: this really was his name. Minor gentry sometimes proclaimed (inappropriately forcefully, we might think) their pedigrees in this manner. Another example is the excellent watercolour painter Hercules Brabazon Brabazon. All the above is based on visits in January 2017. I recently revisited, and found that what had previously been effectively a field, across which the public could roam, in front of the house has been dug up and is being turned into a private lawn and garden. The fence that separated the field from the house (visible in, for example, the second and third photos in this post) has been removed. 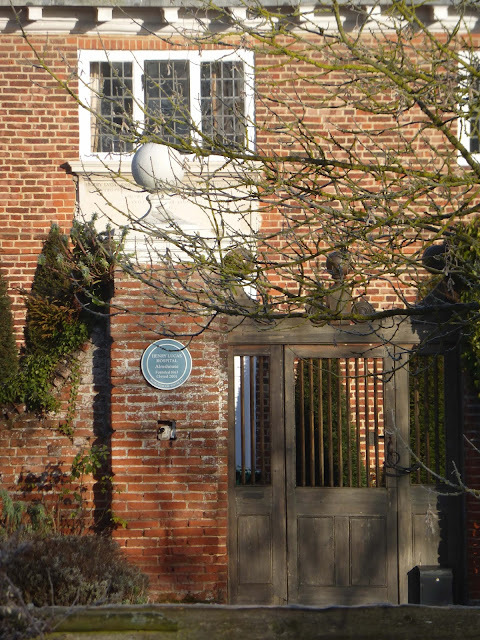 This all means that now only a much more distant view of the front of the house, through a heavy screen of trees, can be obtained, though the public can still get a good view from the side, over the main entrance gate. So the photos I took in January will be among the last close ups. Going through old photos recently I came across this one, taken by my mother in 1983. She remembers going on a tour round the building (so my statement about it never being open to the public is wrong); she has written 'Matron's reception room' on the back. Where this room is I don't know. It's clearly not the same window that features in the Piper photo and the Lucas oil painting. 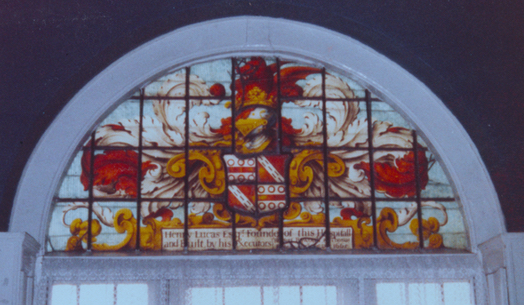 Although 17th century glass like this (this window is dated 1665) is generally called 'stained glass', it's not stained in the same way as medieval or Victorian glass. What we might call traditional stained glass is mostly coloured, cut into irregular shapes often corresponding to the objects depicted and with details painted in black or brown. Between the Reformation and the 19th century Gothic Revival, however, coloured ('stained') glass was not made, so pictorial windows consisted of painted coloured designs on white glass (which was usually cut into regular (mostly square) shapes). The discovery of this photo brings hope that there must be other interior shots waiting to be discovered. The Lucas Hospital briefly found itself at the centre of a minor scandal in 1846. Hansard records that in June of that year Earl Grey* (shortly before becoming Secretary of State for War and the Colonies) brought up in the Lords a petition from the churchwardens of Wokingham. At the time it was the norm for men of the Church to subcontract their jobs; someone was paid to fill a post, and instead of filling it themselves paid a priest lower down the hierarchy to do it, but paid them less, and pocketed the difference. Thus those higher up the hierarchy were paid for doing nothing. 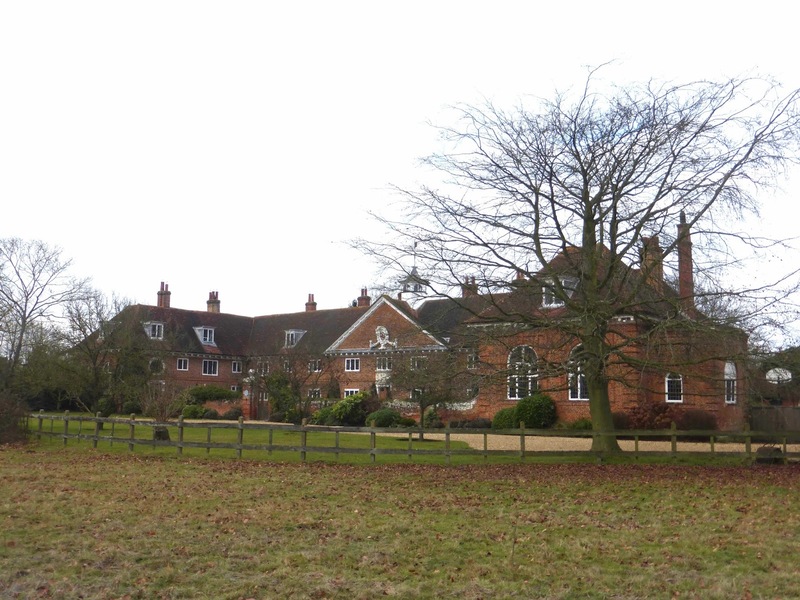 Grey pointed out that the Dean of Salisbury was the nominal rector of Wokingham, and that he’d been paid £2,200. Out of this money he paid a perpetual curate £200 to attend to the spiritual needs of the parishioners of Wokingham, and retained the remaining £2,000 for himself. (This doesn’t necessarily mean that he spent all or most of it on luxuries for himself, his family and friends, of course, though he might well have done.) Thus the perpetual curate of the town, the Rev. Thomas Morres, had to live on £150 p.a. (where the other £50 went is unclear to me), and found it necessary to employ an assistant curate at the weekends so the job could be done properly, who** he paid £40, leaving himself only £110 (the equivalent of about £12,000 today). Morres found that this wasn’t enough, and to make ends meet had taken on the job of master of the hospital at an additional salary of £100 (plus board and lodging, I should think). The consequence was that he could no longer devote himself to his main job, and this was the complaint of the parishioners, who felt abandoned. They also objected to the fact that their church was in a very poor state of repair despite there being no shortage of tithe money, most of which was being hoovered up by the Dean; the Dean, however, perhaps in a fit of conscience or perhaps simply realising that the game was up, had recently resigned. The Bishop of Salisbury, who was present in the Lords when Grey presented the petition, admitted that ‘it was most advisable some remedy should be devised for the grievances to which he [Earl Grey] had directed the attention of their Lordships’, though he stopped short of actually criticising the Dean. I lack the resources and research skills to follow up the results of this scandal, but I do know that Wokingham parish church wasn’t restored until 1862, sixteen years after the petition, so it seems that the parishioners eventually won some justice, though it was a long wait. * This was Henry Grey, the 3rd Earl Grey, the son of the 2nd Earl who is famous for getting the 1832 Great Reform Act through Parliament and for giving his name to my second favourite variety of tea. ** Strictly, this should be ‘whom he paid’, but the use of ‘whom’ is withering, and I don’t think we’ll be any the worse if it fades away altogether. When I first decided to write a post about the Lucas Hospital I assumed that all I’d be able to find to say was something along the lines of ‘Here are some pictures of a building. Isn’t it beautiful?’ Now I see that I’ve written over 2000 words. If anyone reads this far down, apologies for my prolixity.